Everything on the board is settled and the players have to make the largest yose moves. But it was a fast online game and the minds are still in the middle game, so the moves that are not in the spirit of the position were made. I believe that the moment of the transition to yose is very important in a game. The player who makes it first usually gains several points. On the other hand, the player who insists on continuing fighting the chuban loses points. White 1 (262) loses points if Black plays correctly. It is a desperate attempt to squeeze something effective. It was not punished in the game. 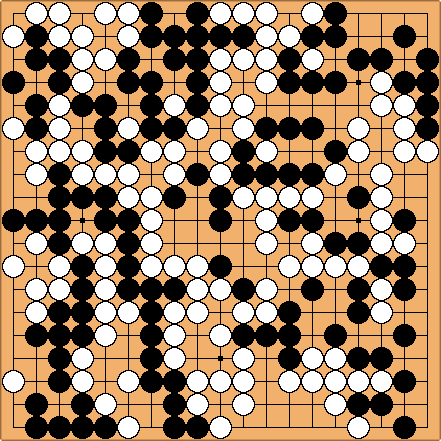 White knows that his group is dead, but Black has an eyeless group squeezed between two white groups, so White seeks his chance. Black 2 is a sacrifice that allows him to kill White's group faster. It is necessary sooner or later (or another defensive move in his own territory), but is it urgent? White 3 captures, still hoping for something. Black 4 plays atari. Again, was it urgent? White 5 takes one outside liberty from Black and threatens to enclose the territory in that region in sente. Black 6 is a one-point move (1/2 miai). Black had bigger moves on the board. Black 8 is absolutely necessary. White's groups are not only dead but cold now. White 9 is a sente move. White returned to ordinary yose moves. BillSpight: Black 2 is not good. The right local play is at b, to prevent White's eye. With no eye, White poses no threat. Black 4 is worse. Black still needs a protective play. Black 4 loses one point inside his territory. But the big play for Black is on the right side, at a.